WESLACO – A tiny insect of unknown origin is posing a serious threat to the billion dollar Texas grain sorghum crop, according to Texas A&M AgriLife Extension Service experts. The threat comes at a time when a lingering drought and market pressures suggest growers will plant a larger than normal crop this year. An insecticide known as Transform WG was tested and found to be effective against this pest, Villanueva said. The Texas Department of Agriculture recently submitted a request to the U.S.Environmental Protection Agency to approve an emergency exemption for its use on grain sorghum to control the aphid in Texas. It is among 10 pesticides now being tested in Texas and Louisiana for their ability to manage sugarcane aphid populations. Villanueva said he will supervise the evaluation of two groups of possible candidates, lady beetles and lacewings. The sugarcane aphid, about one-sixteenth of an inch long, was first detected in 1977 in Florida sugarcane. It limited itself to the Sunshine State until 1999 when it was found in Louisiana sugarcane, Villanueva said. While populations were well established, they did not cause major crop damage in either state. Severe damage to grain sorghum in all these areas came quickly. Besides decreasing yields, the aphid produces abundant honeydew, a sticky excrement that keeps grain from dislodging from the plant at harvest and gums up harvesting equipment. Mild winters have also helped the aphid survive, Villanueva said, and so far this year, the weather likely hasn’t been cold enough for extended periods of time to slow them down. 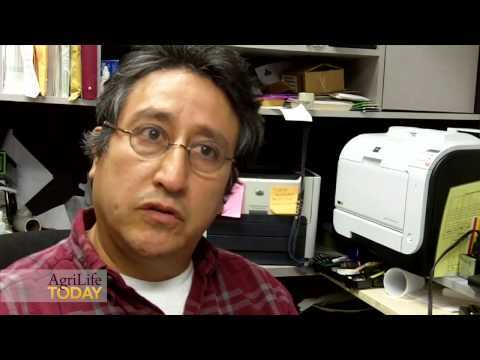 Grain sorghum is usually a lucrative crop that is relatively inexpensive and easier to grow than cotton, according to Dr. Luis Ribera, an AgriLife Extension agricultural economist in Weslaco. Most of the grain sorghum grown in Texas is used in cattle feed. Ribera said the farm gate value of grain sorghum in extreme South Texas is $157 million, with a total economic impact on the area economy of $317 million. Statewide, the crop is worth $974 million to growers with a total economic impact of $2 billion, he said. Experts in the Coastal Bend are concerned about both yield decreases and the impediment the pest poses at harvest. Jason Ott, the AgriLife Extension agent for agriculture and natural resources in Nueces County, said estimated losses from the sugarcane aphid in his area ranged between 25 and 50 percent, and as high as total losses in some fields. Overwintering aphids now being found on johnsongrass and on remnant grain sorghum in fields harvested last year leave the area susceptible to more outbreaks this year. Dr. Mo Way, a Texas A&M AgriLife Research entomologist in Beaumont who first found the sugarcane aphid in Texas last year, said because so little is known about the pest, it’s difficult to predict the threat it poses this year. Way said growers in the Beaumont area are currently working the ground to plant grain sorghum in late February. He doubts the sugarcane aphid will reduce emerging stands. “Grain sorghum seed that growers plant here is treated with a product that protects them from early season pests, and I’m guessing it may protect them from sugarcane aphid populations,” he said. Way recommends growers monitor their crops closely throughout the growing season. “We didn’t see large populations last year until the grain sorghum crop started heading, when the plant starts producing its grain. But I suspect they were there all along, because populations were so high,” he said. Way suspects growers may have actually stimulated populations of sugarcane aphids when they applied their normal treatments of pyrethroids to control the sorghum midge, small flies that attack grain sorghum at flowering. Way said growers should check different areas of their fields, looking on the underside of leaves for populations of the yellowish green insects. They cause leaf discoloration, and their honeydew makes leaves shiny, attracting sooty mold to the top of leaves. Web Wallace, a crop advisor and executive vice president of the Cotton and Grain Producers of the Lower Rio Grande Valley, agreed.